"Obituary - Amanda Jane Murray"
Death location: Sunset Nursing Home, Farmington, St. Francois County, Missouri. Burial location: Doe Run Memorial Cemetery, Doe Run, St. Francois County, Missouri. Amanda Jane Murray Chapman, Elvins, died Dec. 16 at the Sunset Nursing Home in Farmington at the age of 86. She was born Sept. 18, 1894, in Doe Run to the late John William and Mary Crawford Murray. She was preceded in death by her husband Charles Freserick Chapman, a daughter, Mrs. Rosalee Barnhouse Ervin and three sisters. 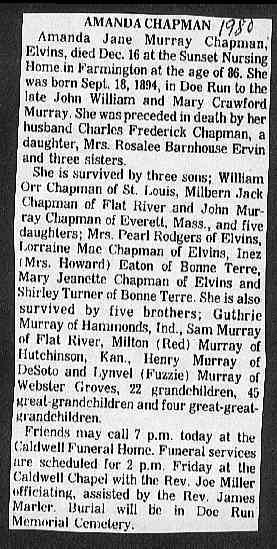 She is survived by three sons; William Orr Chapman of St, Louis, Milbern Jack Chapman of Flat River and John Murray Chapman of Everell, Mass., and five daughters; Mrs. Pearl Rogers of Elvins, Lorraine Mae Chapman of Elvins, Inez (Mrs. Howard) Eaton of Bonne Terre, Mary Jeanette Chapman of Elvins and Shirley Turner of Bonne Terre. She is also survived by five brothers; Guthrie Murray of Hammonds, Ind., Sam Murray of Flat River, Milton (Red) Murray of Hutchinson, Kan., Henry Murray of DeSoto and Lynvel (Fuzzie) Murray of Webster Groves, 22 grandchildren, 45 great-grandchildren and four great-great-grandchildren. Friends may call 7 p.m. today at the Caldwell Funeral Home. Funeral services are scheduled foe 2 p.m. Friday at the Caldwell Chapel with the Rev. Joe Miller officiating, assisted by the Rev. James Marler. Burial will be in Doe Run Memorial Cemetery.